Typewritten Letter Signed, one page, quarto, Atlanta, Georgia, September 26, 1936. To Almira B. Taylor in Hyde Park, Massachusetts. With the original envelope. Margaret Mitchell published Gone with the Wind in June 1936 after working on the book for ten years. It was almost certainly the largest selling novel in the history of U.S. publishing to that time. In the first six months after publication one million copies were sold, 50,000 of them in one day. By 1939 sales had reached two million copies in the United States, and before the author’s death they had totaled eight million in 40 countries. The motion picture rights were sold for $50,000 and the film made from the novel received an Academy Award in 1940 and held the record for gross earnings for more than two decades. 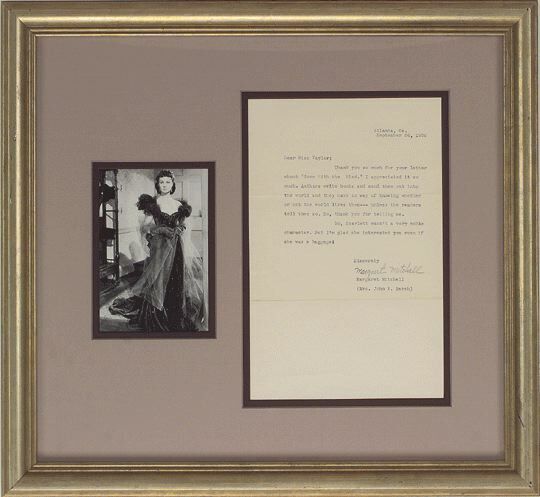 Framed in antiqued gilt with a photograph of actress Vivien Leigh in her role as Scarlett O’Hara. Matted in lavender and plum. Framed dimensions are 19 1/4 inches wide by 17 3/4 inches high.